TONIGHT! 29th Annual MHS Cake Auction, Friday, Feb. 8th. “Welcome to the Muskie Jungle” is the theme. Live and Silent Auctions & 50/50 raffle. Food starts at 5pm with pork loin sandwiches, cake & ice cream. Girls’ & Boys’ basketball doubleheader vs. Davenport West. Varsity Girls @ 6pm, Varsity Boys at 7:30pm. TODAY! Cake Auction Cakes should be delivered to the MHS Attendance Center by 4:00pm. “Welcome to the Muskie Jungle” is the theme. What: A FREE breakfast for any student that was at CAPE. There will be no church-related information, the room you will eat in is also a gym, and there are no religious symbols or affiliations at all. Just simply an alternative to driving out of town at 4 in the morning to the Quad Cities for breakfast after an exhausting evening. The Clinton Varsity Boys’ Basketball Game has been re-scheduled for Monday, Feb 11 at 6:30pm. All other levels/games have been cancelled and will not be re-scheduled. The Girls’ Basketball Games scheduled for Feb. 6 are rescheduled to Saturday, Feb. 9. JV at 1pm, Varsity at 2:30pm. Senior Resources is looking for dependable, hardworking Chore Workers* to remove snow for Seniors in our community. Positions open immediately. $10 per hour!! Workers must be 16 years or older to apply and must be able to pass a background check & have their own equipment. Applications can be picked up at1808 Mulberry Avenue, Muscatine for more information, call: Mayra Garcia (563) 263-7292. Good Luck to the Muskie Swimmers @ State and Muskie Wrestlers at the District Meet this weekend! Yoga Roday: Friday: Pperiods 5 & 6 in Room: 22-007. Students & teachers welcome! Mr. Armstrong’s freshmen PE classes will resume their swimming unit on Monday, February 11 thru Friday, February 15. 8th Grade Parent Meeting @ MHS in Auditorium on Monday, February 11 from 5:15 – 6:15pm. Information that will be covered: Welcome Mr. Hogenson, MHS Principal, Activities information from Mr. Morgan, Course Offerings/Selection Process and Graduation Requirement from Mr. Welsch, 9th Grade Counselor, and any interest in AP Human Geography will be covered by Ms. Hansen. MHS Swing Dance will be held March 9 at The Merrill Hotel from 6-10pm. Admission is $6 at the door. Muskies Against Violence will be celebrating Random Acts of Kindness week (Feb. 11-16) on February 13th. Seniors: We will be hosting our second FAFSA Completion Night on Wednesday, February 13th 3:30pm-7:30pm in the Student Services Office. There will be food and drinks available. Don’t forget that this is your opportunity to be eligible to win $50 and $25 Amazon gift cards if you have your FAFSA done by the end of February. Attached is a checklist of items you need and the poster. Girls’ Track practice begins Monday, February 11 from 3:45-5:30. Be sure all forms are turned in, and physicals are up to date. Any questions, contact Coach Armstrong, or Coach Flowers. Note: If you attended any of the previous sessions, you don’t have to attend the below sessions. We will be going over the same information. National Key Club Week ‐ Key Club is a student organization all about focusing on service projects and supporting causes in our community. This week (February 4th‐February 8th) we are celebrating National Key Club Week. We would love if you would come to one of the Key Club meetings and see what it’s all about. Our next meeting is Thursday, February 14th during Muskie Time. Sign-up in Adaptive Scheduler under Mrs. Rauenbuehler. Yoga This Week: Wednesday: 3:30-4:00 and Friday: 7:45-8:15 Room: 22-007. Students & teachers welcome! MHS YEARBOOKS: Don’t forget to order an MHS Yearbook if you want to guarantee one. They are available to order for $56 until Feb 22. Please go to this link or the Attendance Center to buy one. If you don’t order one, there will be a few available on a first come first serve basis, the day after we pass out yearbooks — but these sell out fast! Attached is the State Wrestling T-Shirt order form. There will not be an online store, only the paper order forms. Orders are due by Feb. 11th @ 10am and returned to Coach Kane. Overdue library book notices went out to parents/students and to ELA teachers – so we have a few students concerned about fines/charges. Please return or renew your library book ASAP! Upcoming Muskie Activities at a Glance.pdf – Updated! Key Club Blood Drive: Any MHS Students or Staff interested in donating blood for the Key Club Blood Drive on Monday, February 11th needs to sign‐up with a Key Club member or email Mrs. Keltner at jen.keltner@mcsdonline.org. Walk‐ins will NOT be taken for this blood drive ‐‐all donors need to have a scheduled time between 8:00am-10:30am. Mad Money Simulation: On Wednesday, February 13th the business dept will be working with Members Community Credit Union and running the Mad Money Simulation. It will run from 8:20 until 11:30 in the Commons. Guys THAW and PROM clothes (pants, shirts, suits) added to the racks. Stop by and check them out today – they’re FREE! 9-12th Grade Girls: FREE THAW dresses to check out in the Main Office – Rm 11-001 with Mrs. Borde before school, during lunch or after school. ADDITIONAL ITEMS HAVE BEEN ADDED – STOP AND CHECK THE NEW SELECTION! FFA Livestock Project: Sign up ASAP if not at the meeting- for anyone showing livestock at fairs. FFA Contest Practice: Sign up for Muskie Times as often as you can. FREE used winter coats available in Student Services for students that are in need and would like to check them out. Ushers needed for Chinese Delegation Performance at Central Middle School on February 14 from 6:30-9:00pm. If interested, please contact Jan Fear at (563) 299-2944. Grant Elementary School is hosting their spring carnival on Friday, March 1st. We are looking for volunteers to run games, hand out prizes, and more from 4:30-7:30. Free dinner is provided! 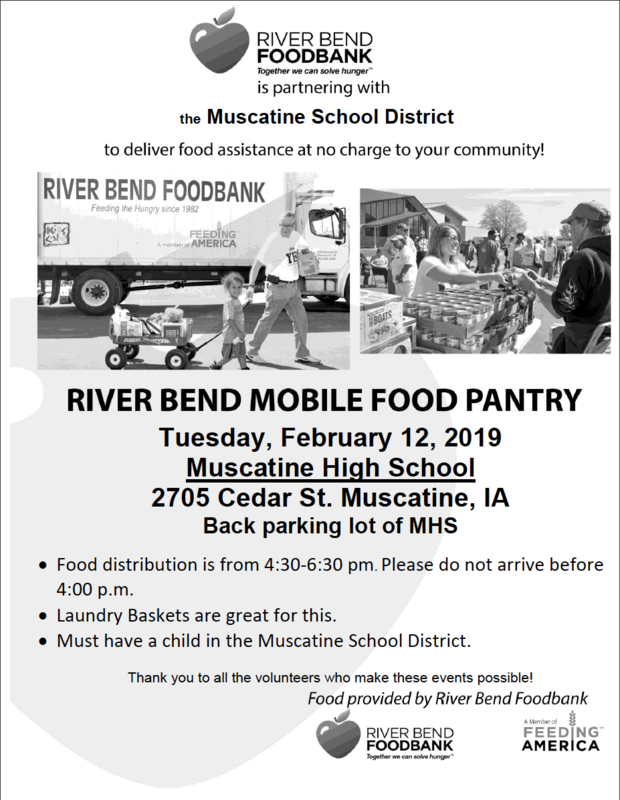 Please contact Jessi Freers at jessi.freers@mcsdonline.org or 263-7005 if interested. Madison elementary is looking for MHS student volunteers to help at our school carnival on Friday, March 8th. Students will be serving food, working carnival games, and taking tickets. The times will be from 4-7:30pm. Please email stephanie.zillig@mcsdonline.org if interested. Madison elementary is looking for MHS student volunteers who love STEM to help facilitate a small group of STEM activities in our gym. The date is April 9th from 5-7pm. Please email stephanie.zillig@mcsdonline.org if interested.